Corporate America, watch out. The administrative workplace of the future just might be the “Winnebiko,” especially if Steve Roberts has anything to say about it. 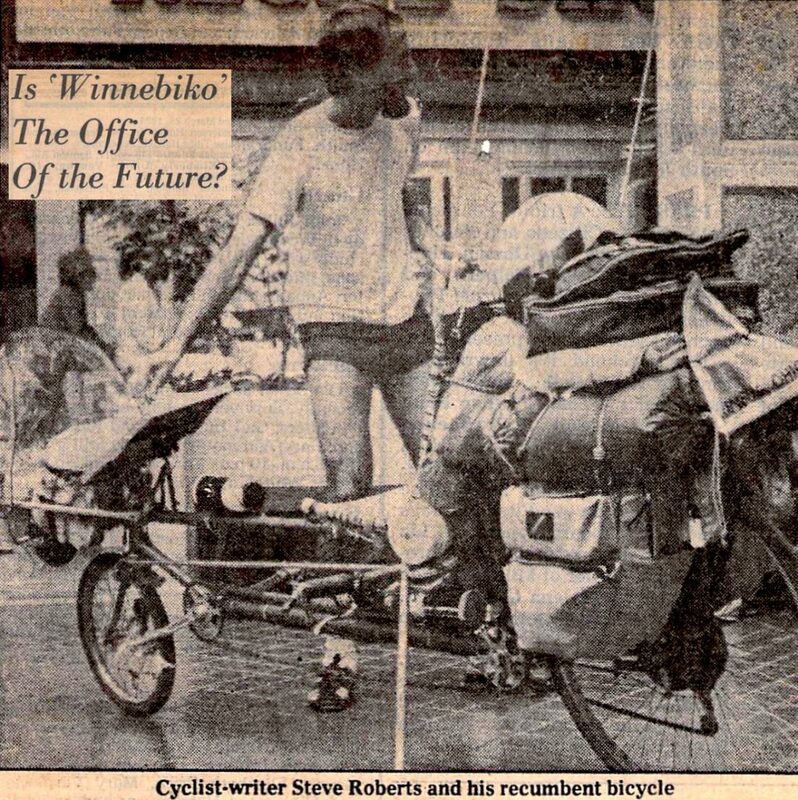 Roberts is a freelance writer who has taken the newest innovation in cycling — the recumbent bicycle — to the road to show that the work office needn’t be something surrounded by four walls. His trip around North America, which he expects to last about two years, is made possible because as Roberts travels, he also works — writing about the trip for various publications, most notably the computer magazine Online Today, along with a book he is completing, he said. This week, Roberts made a stopover in Pensacola and talked about the bike, the trip and what he’s doing. The recumbent 18-speed bicycle, said Roberts, is custom-built, with the main body an eight-foot long Franklin frame. He figures the bike is worth several thousand dollars. Some of the features different from a standard bicycle are the reclining position of the cyclist, handlebars found underneath the seat, a smaller front tire and a 48-spoke rear tire (usually 36- spokes), which provides stronger riding capability. Roberts said. Two solar panels provide the power to charge a battery system that runs the electrical gadgets on the bike. They include: lights (a beam headlight, a flashing light on a safety flagpole, a highway flasher located behind the seat and a taillight); a horn to guard against potential thieves; a CB radio; and a TRS-100 computer, which Roberts uses as a word processor. With all the extra gear, the bike weighs about 160 pounds, he said. For those days the sun doesn’t shine, there’s a small generator. Roberts can also plug in battery system into a socket and recharge it, which he does when he stays at a place for a few days. The bike was built during a six-month period prior to the start of the trip, Roberts said. He was assisted by a professional bicycle builder, but Roberts said he was the project’s coordinator and conceptualizer. Roberts, 31, was born in Erie, Pa., grew up in Louisville. Ky., and used to call Columbus, Ohio, home. Before he took his work to the road, he had written books and magazine articles and given speeches concerning business, computers and engineering, fields he knows very well. He said he gave up the home in suburbia to prove you don’t have to work in an office with four walls. That’s the main reason for the trip. He said riding a recumbent bicycle is very comfortable. He goes several hours at a stretch before stopping for a rest. He averages about 70 miles a day. 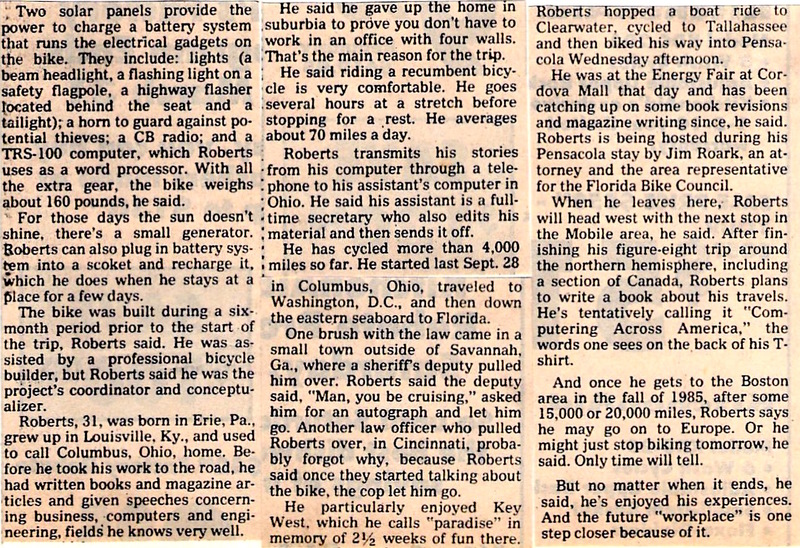 Roberts transmits his stories from his computer through a telephone to his assistant’s computer in Ohio. He said his assistant is a full-time secretary who also edits his material and then sends it off. He has cycled more than 4,000 miles so far. He started last Sept. 28 in Columbus, Ohio, traveled to Washington, D.C., and then down the eastern seaboard to Florida. One brush with the law came in a small town outside of Savannah, Ga., where a sheriffs deputy pulled him over. Roberts said the deputy said, “Man, you be cruising,” asked him for an autograph and let him go. Another law officer who pulled Roberts over, in Cincinnati, probably forgot why, because Roberts said once they started talking about the bike, the cop let him go. He particularly enjoyed Key West, which he calls “paradise” in memory of 2½ weeks of fun there. Roberts hopped a boat ride to Clearwater, cycled to Tallahassee and then biked his way into Pensacola Wednesday afternoon. He was at the Energy Fair at Cordova Mall that day and has been catching up on some book revisions and magazine writing since, he said. Roberts is being hosted during his Pensacola stay by Jim Roark, an attorney and the area representative for the Florida Bike Council. When he leaves here, Roberts will head west with the next stop in the Mobile area, he said. After finishing his figure-eight trip around the northern hemisphere, including a section of Canada, Roberts plans to write a book about his travels. He’s tentatively calling it Computing Across America, the words one sees on the back of his T-shirt. 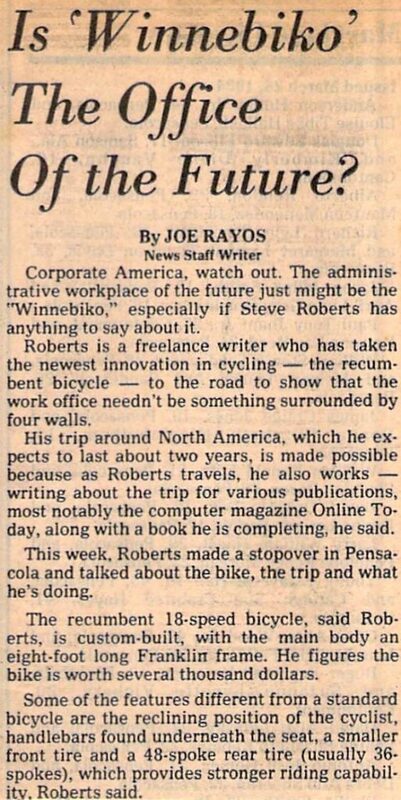 And once he gets to the Boston area in the fall of 1985, after some 15,000 or 20,000 miles, Roberts says he may go on to Europe. Or he might just stop biking tomorrow, he said. Only time will tell. But no matter when it ends, he said, he’s enjoyed his experiences. And the future “workplace” is one step closer because of it.